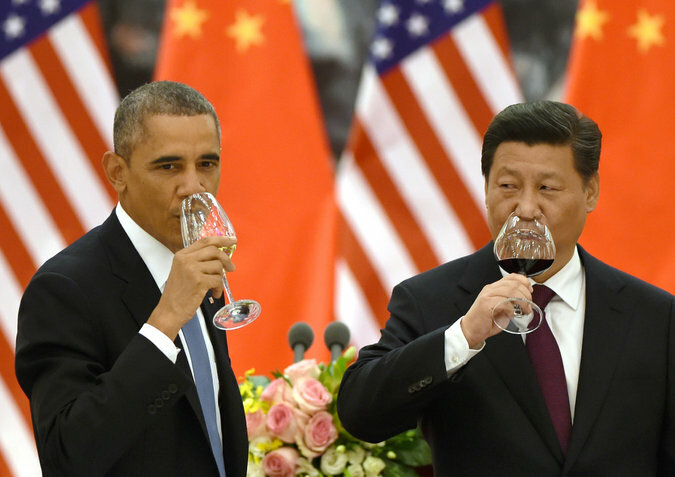 Climate: Are US-China announced emissions cuts enough to halt global warming? November 14, 2014 -- MediaPart, posted at Links International Journal of Socialist Renewal -- An unheard of agreement. Seen by some as historic, taking the words of US President Barack Obama and not putting them into perspective. On November 12, the media and commentators welcomed almost unanimously the joint US-China announcement on greenhouse gas emissions. But what is it really? On November 12, Barack Obama and China's President Xi Jinping announced their targets for cuts to their greenhouse gas (GHG) emissions. The US announced a 26-28% reduction by 2025 compared to 2005 levels. While China envisages a peak in its GHG emissions around 2030, or if possible before. Are these announcements really unheard of? At the Ban Ki-moon summit in New York on September 23, Zhang Gaoli, first vice-minister of China, had already announced that his government wanted to peak its emissions as soon as possible and then reduce them. Furthermore, China had already announced its intention to reduce the carbon intensity (GHG emissions per unit of GDP) of its economy by 40-45% between now and 2020 in relation to 2005. Only the rather distant date of reaching it by 2030 is new. On their side, the US and Barack Obama had already announced its goals for 2020, announcing an emissions reduction of 17% based on 2005 levels. A pledge for 2025 is therefore new. If China's emissions only peak in 2030, that means they will continue to rise until then. Despite a probable significant reduction in the carbon intensity of the Chinese economy in the coming years, Chinese leaders have just announced that they will continue to break yearly GHG emissions records for the next 15 years. It must be pointed out that the US has established its emissions directions based on a 2005 level. That's the highest ever year of US emissions, with almost 7200 Mt CO2e. Compared to 1990 levels – the year used as the international benchmark – the US targets are nothing if not modest. They equal an annual reduction of -0.43%. Historic? Are these announcements up to the challenge? The Intergovernmental Panel on Climate Change (IPCC) report published on November 2 this year underlines what's needed. To avoid global warming beyond 2 degrees celcius before the end of the century, we must not go beyond a concentration of 450 parts per million (ppm) of GHGs in the atmosphere. To do that, global emissions must be reduced by 40%-70% by 2050, in relation to 2010, and lead to almost zero emissions from here to 2100. According to the IPCC, emissions need to peak and decline thereafter as quickly as possible, before 2020 would be better, inviting the biggest emitting countries and those most able to take action, to significantly reduce their emissions by 2020. The US and China represent almost half of global emissions (around 45%). Their emissions reductions are therefore crucial. Regarding their far more important historical responsibility, the US must, as a minimum, like the European Union, reduce its emissions by at least 80% by 2050. Assuming they deliver their 2025 commitments, that means they will need to reduce their emissions by almost 5% per year between 2025 and 2050, around 10 times their commitments up to 2025. Put another way, the US will delay the majority of its efforts until after 2025. On the side of the Chinese, all of their emissions reductions are delayed until 2030. Therefore neither the US nor China are meeting what's demanded by the IPCC. How to interpret these announcements? Much more than actual numbers commited, the joint announcement from the USA and China must be interpreted in terms of what it means geopolitically. The announcement has been made outside any international negociation, thus marginalising and delegitimising these. If the two world powers can make agreement on the side, what is left to negociate for the 194 other countries in terms of emissions reductions? More importantly, the USA has given itself a 2025 objective, when international negociations invite states to use objectives for 2030. This announcement simply means that neither the USA nor China will accept imposed objectives towards the struggle against climate chaos. Neither by the UN, nor by other countries, nor by what the science demands. This announcement clearly expresses that Chinese and US engagements around the question of the climate crisis are only based on their national situations, as well as the geopolitical equilibrium between the two powers, and not on any shared planetary efforts. The two powers do not wish to commit in any way that is appropriate to the scale of the problem, especially not unilaterally. The USA and China have thus just buried the struggle against climate chaos in the depths of international geopolitics. By presenting their joint announcement in a very positive way, US and Chinese diplomacy has de facto frozen international negotiations in quasi-generalised global inaction. Any kind of constraining agreement – which the USA and China do not want – that would be just and appropriate to the scale of what is at stake at the 2015 UN conference in Paris, is now simply an illusion. NGOs, ecological and social movements, citizens, commentators and opinion makers now have two options. Either to go along with the language communicated by US and Chinese diplomacy, and to congratulate themselves on such an agreement, thus contributing to the endorsement of absence of ambition and the diplomatic freezing of negotiations around the worlds biggest powers. Or, it is possible to explain the situation, to work from the facts, to assess the commitments and to demystify what is absolutely not an historical agreement appropriate to the scale of what needs to be done. We must not delude ourselves. With such limited commitments, the US and China are taking the risk, if (and only if) global public opinion grabs the issue, to find themselves on the front line of those responsible of the worsening of climate chaos. By rejecting leadership with regards to climate chaos, just like the European Union, whose objectives are not appropriate either, they could find themselves isolated from international civil society. This is only if we overcome the trap of inaction set up by the US and Chinese diplomacies.